Lindsay fell in love with henna during her trip to Morocco in 2011 (her first trip to Africa). After extensive research and training, she became a cultural advocate for this ancient and traditional African beauty and spiritual practice. The practice of applying henna to bodies has taken place in African communities for centuries. In Mali, Guinea, Zanzibar, Nigeria, Morocco, Somalia, and Ethiopia, communities of women gather to share in an exchange of sisterly energy. The application of henna onto black female bodies continues to dominate the spaces of African women. As a black American, Lindsay has made it her mission to reclaim this indigenous practice of ours (as many only know it to be a practice solely of Indian and Arabic origins) by adorning and advocating in Houston, Texas. In 2016, she decided to open her own business, Henna by Lindsay. 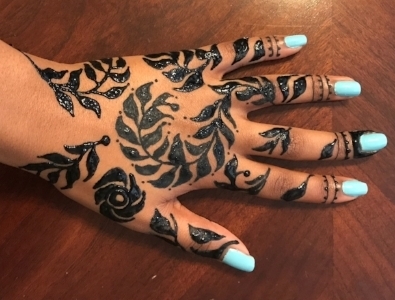 Not only does Henna by Lindsay adorn bodies through henna, jagua, and African-inspired body paint services, but most importantly, this company provides an experience of love and light (complete with natural, plant-based products) that helps clients feel beautiful inside and out. Henna by Lindsay is perfect for private appointments, group celebrations, and large-scale events.